Saurfang has been through a lot. You could call him the Orc that lived. A member of the Blackrock clan, he’s seen all three of the Wars that define the Warcraft setting, and much of the aftermath. He fought in the original Horde battles on Draenor. He drank the demon blood freely and served as a lieutenant to both Blackhand and Orgrim Doomhammer, rising eventually to the position of Second to the Warchief. During the First and Second War, Varok Saurfang was second in command of the Horde. He slaughtered Draenei children in Shattrath and the Black Temple campaign. He helped sack and destroy Stormwind, and he was part of the army ultimately defeated by Turalyon in the shadow of Blackrock Mountain. Born to the same family as Broxigar the Red, Varok Saurfang has literally never stopped fighting. And in a way, that’s the great tragedy of his life — he’s lived so long and done and seen so much, he can’t help but see when patterns repeat themselves and cycles of hatred resume. He was there when it all happened the first time. Let’s not mince words — the Old Horde was a force of Orcs drunk on demon blood and powered by racial hatred. They murdered the Draenei in a series of atrocities so awful that to this day, Varok Saurfang and other Horde veterans are affected by the memories of their actions. And these are veterans of the brutal internecine struggles for survival that their clans endured on Draenor. They’re the people who fought the Ogres of Goria and endured the Red Pox created by Imperator Molok in a war so terrible they stopped functioning as the Horde for generations. 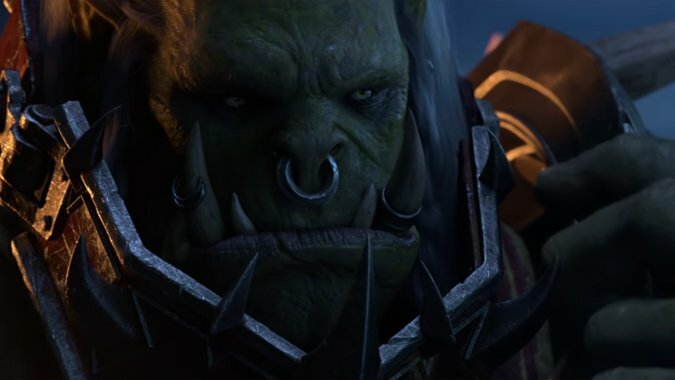 Saurfang has seen every aspect of the Horde war machine from the moment Gul’dan and Blackhand created it till the modern day, and has played a leadership role throughout its history. The Horde that burned Stormwind? Saurfang was its second in command. The Horde that rotted in internment camps until Thrall and Orgrim came to free them? Saurfang huddled dispirited by those same fires, haunted by those same crimes. They were his crimes. The Horde that sailed across the seas to Kalimdor, fought the demons atop Mount Hyjal alongside Night Elves and Humans? Saurfang helped train and lead those troops, be they Orcs, Trolls or Tauren. The Horde that fought in Silithus alongside the Alliance to defeat C’Thun? Saurfang led the combined armies of both factions, the Might of Kalimdor. Several of the Elves who died in Ashenvale and Darkshore once called Saurfang sir, and followed his orders. Saurfang advised Garrosh Hellscream in Northrend, where he lost his son Dranosh twice, first to the Wrathgate and then to the Lich King’s foul necromancy. And when the Horde split itself apart in civil war, Varok Saurfang helped Thrall confront Garrosh deep within the fortress the mad Warchief had excavated from Orgrimmar’s heart. Saurfang has seen the Horde at its noblest and its foulest — has killed innocent children and sacked cities, and has defended the world from demons and the Scourge. In many ways, Saurfang is an exemplar of the Horde. He is also an old Orc who has been fighting for decades. Saurfang’s brother, Broxigar, survived all three of the wars and felt himself denied his Warrior’s death. Imagine, therefore, how Saurfang must feel. Broxigar finally got his Warrior’s death, dying gloriously striking a blow against Sargeras himself and making the survival of the Night Elves and their world possible. 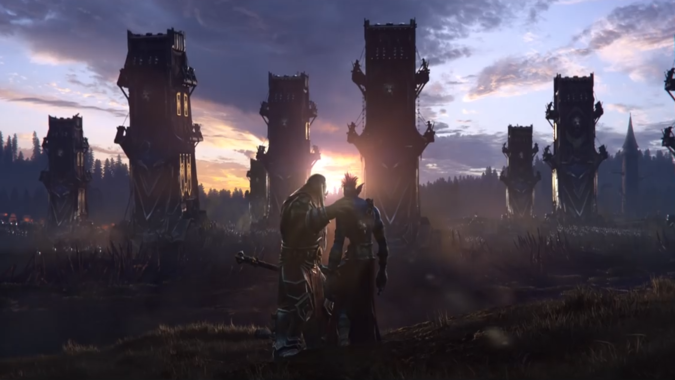 Saurfang’s son Dranosh, who he left behind on Draenor to honor the wishes of his deceased mate, came to Azeroth seeking to honor his father and died fighting the Lich King. And yet Saurfang endures. War after war fought, battle after battle, some for the best of reasons and some for almost no reason he could name. Where has his honorable death been? It has not come. And this is troubling for Saurfang because, by now, he’s seen the Horde of Doomhammer and the Horde of Thrall. He’s seen the Horde of Garrosh, the Horde of Vol’jin, and the Horde of Sylvanas. And he knows that when honor is not preserved — when even he can strike a dishonorable blow from behind in the heat of the moment and in so doing cost himself everything he’s fought for — he might never be able to achieve that honorable death. When Saurfang says Honor, young heroes… no matter how dire the battle… Never forsake it! he is saying this as someone who has forsaken it before. He’s seen the cost of it. He’s seen how far the Horde sank under Gul’dan’s sinister influence. He’s been the one forsaking his honor, and he fears letting himself do it again. 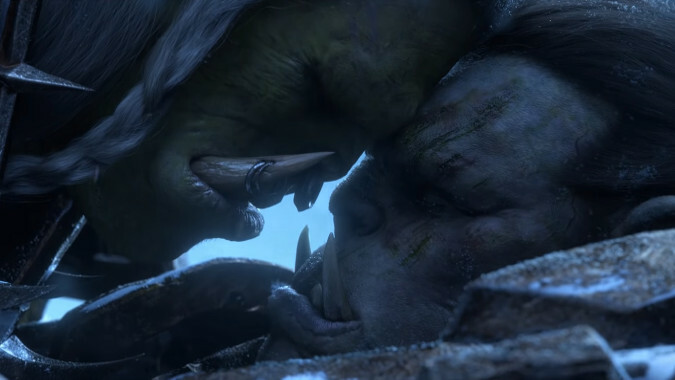 Saurfang has no love for the Alliance — they’ve been his enemies for decades. And it’s clear he doesn’t particularly respect them or their sense of honor. But his own sense of honor is of critical importance to him entirely because he’s failed to live up to it before. Two examples of that are his speech to Garrosh Hellscream in Borean Tundra, and his actions at the Battle for Lordaeron. High Overlord Saurfang says: I drank of the same blood your father did, Garrosh. Mannoroth’s cursed venom pumped through my veins as well. I drove my weapons into the bodies and minds of my enemies. And while Grom died a glorious death – freeing us all from the blood curse – he could not wipe away the terrible memory of our past. His act could not erase the horrors we committed. 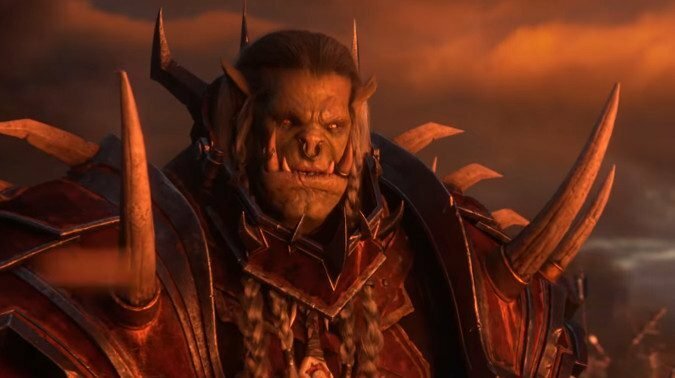 High Overlord Saurfang says: The winter after the curse was lifted, hundreds of veteran orcs like me were lost to despair. Our minds were finally free, yes… Free to relive all of the unthinkable acts that we had performed under the Legion’s influence. Broxigar didn’t have to just keep living with this. He got to die a hero, saving a world from the Archdemon himself. Varok has had to live with this. His threat to Garrosh — I won’t let you take us down that dark path again, young Hellscream. I’ll kill you myself before that day comes… ended up being an empty one. Garrosh became Warchief and Varok was not there, dealing instead with his grief over his son’s death and his ‘retirement’ that ended up being short lived. Saurfang came back to oppose Garrosh, but by then the Horde had fractured over what he had done. This time, however, Saurfang has seen what Warchief Sylvanas Windrunner has done with his own eyes. He’s been a front row witness to all of it. The conquest of Teldrassil and occupation of the city left him feeling uneasy but it wasn’t dishonorable as such. He even attempted to preserve his honor by capturing civilians and not offering harm to anyone who wasn’t a combatant before his anxiety over leaving his Warchief alone against Malfurion Stormrage caused him to attack the Druid from behind. It was a cowardly act even he admitted was dishonorable. But as bad as that was, it was nothing compared to witnessing Sylvanas’ order to burn Teldrassil, and seeing that the Horde would follow that order, even when he personally tried to stop them. Witnessing just how far Sylvanas would go for victory, and hearing from her own lips that honor means nothing to a corpse, convinced him that there was no way to live with himself as a servant of the Horde under Sylvanas. Like Blackhand or Doomhammer or Garrosh, Sylvanas would never choose honor over a win. The Horde ideals of Blood and Honor were meaningless to her. 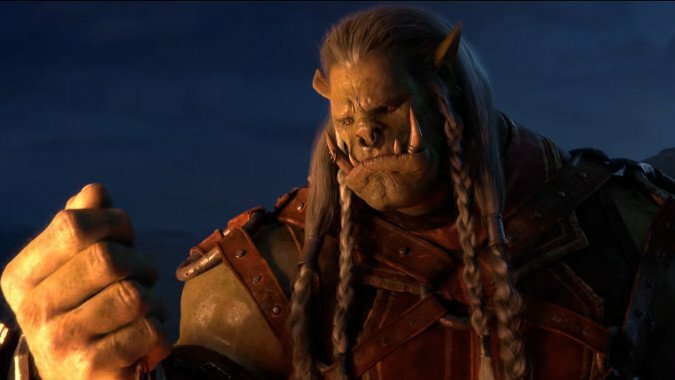 The reason Saurfang warns so stridently about never forsaking Honor no matter how dire the fight is because he knows just how easy it is for Horde Warriors — even for him — to forsake honor in exchange for victory. That essential conflict has been acted out under multiple Warchiefs in his lifetime. He’s witnessed Blackhand sell his people out for power. He saw Doomhammer ultimately choose expediency and allow Gul’dan to live instead of honoring his slain friend, and watched that cost the Horde dearly. He’s seen Garrosh turn from an honorable if hotheaded young Orc to one obsessed with victory at all costs. Now in Sylvanas he sees someone far worse — someone cynical enough to kill her own troops with the Blight and reanimate them as mindless undead. Garrosh was many things, but he was never cynical. Even as he took any action he deemed suitable for victory, he saw honor as important enough that he killed his own subordinates for overstepping it. Sylvanas simply does not care. Survival is everything to her, but Varok has survived and survived and watched others pay the price and felt himself fail to live up to his own ideals. He knows the cost of willfully abandoning them all too well. Make no mistake — what comes next is a war for the soul of the Horde between the Banshee Queen, who holds honor as an absurdity, an impediment to success, and Varok Saurfang, who knows that success without honor leads to the destruction of everything you are. He’s seen it. He’s lived it. He’s failed to live up to his ideals, and he knows what it cost him.